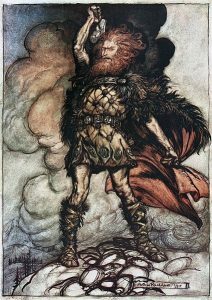 Thor is known by many names, but whether it is Perun, Thunderer, or in some parts of the far north, even giant-slayer, he is always hailed as the mightiest of warriors and master of the battlefield. Worshippers of Thor often bellow, “Thor’s thunder in your ears; Thor’s roar, the last you’ll hear,” while crashing a warhammer into the face of a foe. This brief litany on the battlefield that accompanies head-bashing is most pleasing to Thor as he is a god that appreciates action far more than wordy rants of worship. Deities: Thor and any deity whose portfolio includes storms or grants the Air or Weather domains. This domain is also available to druids through their nature bond class feature with GM permission. Granted Powers: You can use electricity to buffer your defenses, launch powerful electrical attacks, and even ride bolts of lightening to a new destination. Lightning rod (Sp): As a standard action, you can call down a bolt of lightning targeting any foe within 30 feet as a ranged touch attack. This bolt deals 1d6 points of electricity damage + 1 point for every 2 cleric levels you possess. You can use this ability a number of times per day equal to 3 + your Wisdom modifier. Shocking touch (Su): At 8th level, as a standard action that does not provoke an attack of opportunity, you can make a melee touch attack to deliver a shock of electricity that deals 1d8 points of electricity damage + 1 point for every cleric level you possess and causes the target to become stunned for 1 round. A successful Fortitude save negates the stunned effect. You can use this ability once per day at 8th level and an additional time per day for every 4 levels beyond 8th. Domain Spells: 1st-shock shield (UC), 2nd-defensive shock (UM), 3rd-elemental aura [electricity] (APG), 4th-storm step, 5th-ball lightning (APG), 6th-lightning arc (UM), 7th-jolting portent (UC), 8th-stormbolts (APG), 9th-ride the lightning (UM). Deities: Thor and any deity whose portfolio includes storms. Granted Powers: You are a master of sound manipulation, able to damage foes, quiet footfalls, and enhance your perceptual abilities. Thunder Boom (Sp): As a standard action, you can create a bubble of pure sound and hurl it at a target within 30 feet as a ranged touch attack. If you hit the target, the sonic bubble bursts releasing a peal of thunder which deals 1d6 points of sonic damage + 1 point for every 2 cleric levels you possess. You can use this ability a number of times per day equal to 3 + your Wisdom modifier. Muffle Sound (Ex): At 6th level, you gain resist sonic 10, which increases to full immunity at 20th level. At 8th level, as a free action, you can dampen the sounds made by your movement to gain a +2 bonus on Stealth skill checks. You can use this ability for a number of rounds per day equal to your cleric level. The rounds do not need to be consecutive. Domain Spells: 1st-ear piercing scream (UM), 2nd-piercing shriek (UM), 3rd-distracting cacophony (UM), 4th-echolocation (UM), 5th-sonic thrust (UM), 6th-wall of sound (UM), 7th-ki shout (UM), 8th-resonating word (UM), 9th-shout, greater. The following spells are used by clerics of Thor. With your last utterance, you spew forth a cone of deafening thunderous sound that creates a wave of concussive force. 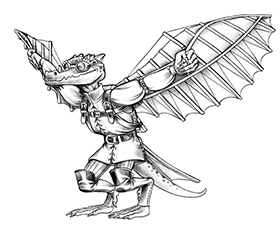 Creatures in the affected area take d6 points of sonic damage per caster level (minimum 15d6), are knocked prone, and are rendered deaf. A successful Reflex save results in half damage. A successful Fortitude save negates the deafness and allows targets to remain standing. With a wag of your finger and several guttural words, you cause the minds of your enemies to be filled with distracting peals of thunder. Each affected creature takes a −2 penalty on attack rolls. The penalty increases to −4 at 15th level, and −6 at 20th level.